Bellevue obviously was inadequate and too far out, lacking about every amenity needed for football. Agitation to build a new stadium somewhere near the original site culminated in the erection of City Stadium, behind the new high school. 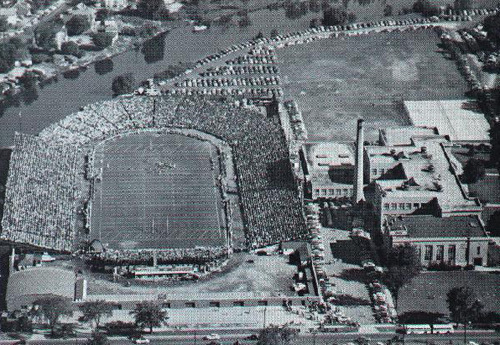 The new facility was barely completed in time for the 1925 opening, but it was an immediate success (the Bears opener drew a record crowd of 5,389). It was a typical small-town park of its day, with wooden fences and stands on both sides between the 30-yard lines. 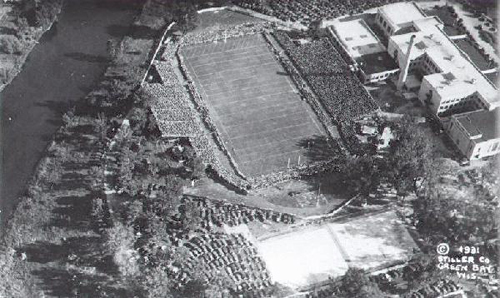 Seating capacity was gradually increased until it seated 15,000 by 1934, with the end zones still uncovered. With the filling in of the area around the end lines, the ultimate capacity of just over 25,000 was reached. After World War II, City Stadium gradually faded from its once proud position as one of the favored fields in the National Football League, to an inadequate and obsolete installation. As pro crowds increased it was impossible to expand the stadium any further. With limited capacity, the Packers found it increasingly difficult to schedule top opponents at home. On Nov. 18, 1956, the Packers lost their final game at the stadium, to the 49ers. A new City Stadium, on Green Bay's west side, opened the following year (renamed Lambeau Field in 1965). On March 14, 2008 Greg Bins who lives 3 blocks north of Lambeau Field wrote: City Stadium continues to serve as the home of Green Bay East High School. Several years back, the front facade was rebuilt with new ticket windows and rededicated before that football season which included the 100th football game between East and Green Bay West. The Packers even went back for an evening practice during training camp last summer.